This is a rectangular Grand Union Hotel porcelain sign. This particular Grand Union Hotel sign is white with black print. 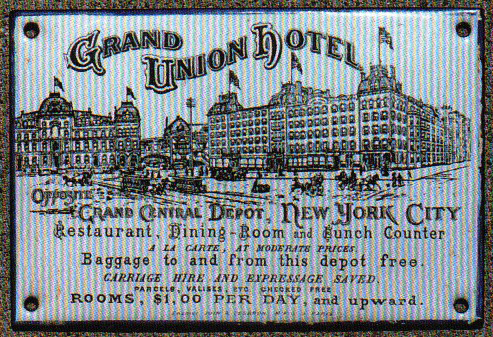 It reads, “Grand Union Hotel, Opposite Grand Central Depot, New York City, Restaurant, Dining-Room and Lunch Counter, A La Carte, At Moderate Prices, Baggage to and from this depot free, Carriage Hire and Espressage Saved, Parcels, Valises, Etc. Checked Free, Rooms, $1.00 Per Day, and upward.”. The upper half of this Grand Union Hotel sign features a drawing of the Grand Union Hotel with a busy street in front.